We reach the town early in the morning and make our way to the Arunachaleshwarar temple, where many saints and sages have lived for thousands of years. In the last century, Ramana Maharshi spent many years in samadhi here. The temple is built for the element of fire and is one of the Pancha Bhuta temples, the ancient shrines built for sadhana for each of the five elements – earth, water, fire, air, and space. The temple is located at the foot of the Arunachala hill, which is itself held as a sacred linga. There are many Shiva legends associated with Arunachaleshwarar, one of which recounts how, at this place, Shiva transformed himself into a towering column of fire touching heaven and earth. The temple is well known for its 1000-pillar mandapam, its rajagopuram, which is among the tallest in the country, and the pathalalinga – the place where Ramana spent years in sadhana. After the temple, we trek a short way up the Arunachala hill to the Ramanashram and Virupakshi Malai caves, where Ramana Maharshi spent over a decade in meditation. It was while he was in these caves that many of his first devotees visited him, and he came to be known as Bhagwan Ramana Maharshi. After our day at the temple for fire, we journey to the Jambukeshwarar temple at Thiruvanaikaval, built for the element of water. At the temple, an underground water spring fills the sanctum where the linga stands. Uniquely, the priests at the temple dress up as women before performing the afternoon rituals. The story behind this practice is that Parvati performed penance on this spot and created a linga from the waters of the nearby Kaveri River. 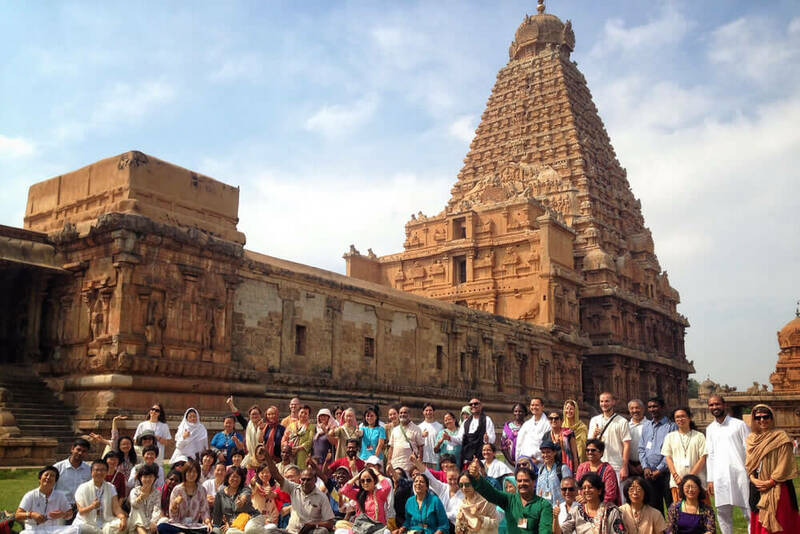 Early morning finds us at the Brihadeeswarar temple at Thanjavur. Though not a Pancha Bhuta temple, Brihadeeswarar is one of the most famous of India’s temples, known the world over. Over 1000 years old, it is sometimes simply referred to as the “Big Temple.” Considered the pinnacle of Chola dynasty architecture, its most famous architectural feature is the immense 66-meter tall shikhara, or central tower, which is capped by a single stone weighing almost 100 tons. The interior of the shikhara is lined with steps, giving us the opportunity to climb up the tower and glimpse this audacious piece of engineering up close. Brihadeeswarar was associated with Karurar, one of the siddhas in yogic lore, whose samadhi is situated within the temple compound. From here, we travel to Rameshwaram and stop at Ariyaman beach a few kilometers before the town. The pristine blue ocean and white sand make it a picture-perfect beach. The ocean here is very still, making it an ideal spot for swimming, even for less-experienced swimmers. The quiet beach is also a great place to relax and unwind. At Rameshwaram, we visit the Ramanathaswamy temple, the southernmost of the twelve Jyotirlingas. The Jyotirlinga is one of many lingas at the temple, which include a linga made of salt, one of crystal, and one of sand. Legend has it that both Rama and Sita worshipped Shiva here, and Sita created the linga of sand after Rama defeated Ravana. The temple is also famous for its 22 teerthams, or sacred water bodies, which were consecrated by none other than Patanjali, the father of modern yoga. We also travel a short distance to Dhanushkodi, one of the last points on the Indian mainland, immortalized in the Ramayana as the point where Rama’s bridge to Lanka begins. Dhanushkodi was once a bustling town, but it was completely destroyed half a century ago by a cyclone. All that is left today are a few remnants. Train tracks, a railway station, a school and a few other buildings stand amidst the shifting sands and winds of the beach, giving the place an otherworldly feel. The program culminates with Guru Pooja, an offering of gratitude to the great beings of the past who have made available the powerful possibility of self-transformation. 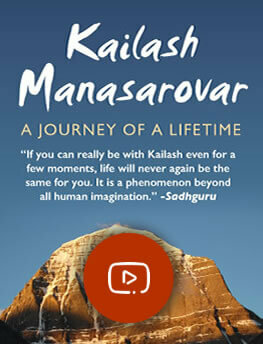 We begin the return journey to the Isha Yoga Center the same night, and we arrive on the morning of Day 6.